Gennaro Gattuso given four-match ban for headbutt. AC Milan's Gennaro Gattuso has been banned for four matches after clashing with Tottenham assistant coach Joe Jordan during a Champions League tie. Midfielder Gattuso headbutted Jordan following his side's 1-0 defeat in the first leg of their last-16 encounter at the San Siro and has since apologised. European football's governing body Uefa handed down the punishment after a disciplinary hearing on Monday. But Milan have said that they will not be appealing against the decision. The 33-year-old former Rangers star had already been ruled out of the second leg at White Hart Lane on 9 March after picking up a booking in the first match. The veteran Italian headbutted Jordan as tempers flared at full-time in Milan 1-0 Champions League . "I lost control. There is no excuse for what I did. I take my responsibilities for that," the Milan captain said. "I was nervous. We were both speaking Scottish, something that I learned when I played in his home city of Glasgow, but I can't tell you what we said. "I didn't want to argue with players and I did it with him but I was wrong to do what I have done. I will have to await what they decide." Gattuso and 59-year-old Scot Jordan had already clashed on the touchline during a bad-tempered second half in which Mathieu Flamini escaped with a only booking for a two-footed challenge on Vedran Corluka. Croatia full-back Corluka left the field on a stretcher and was later seen on the substitutes' bench with crutches and an ice pack on his ankle. "The tackle from Flamini was a horrendous tackle," Tottenham boss Harry Redknapp commented. "It was a sending off. He was two or three feet off the floor with his two feet raised. It was a leg-breaking tackle." The Flamini challenge turned the second half into a feisty affair, with Gattuso becoming increasingly aggressive. The Milan skipper, making his 450th appearance for the Rossoneri, confronted Spurs striker Peter Crouch before collecting a booking that will rule him out of the second leg for a lunge at Steven Pienaar. At the final whistle, Gattuso removed his shirt and headed straight for Jordan, hurling abuse at the Spurs first-team coach before lashing out with his head. The Italian was pulled away by team-mates and briefly stopped to embrace Spurs defender William Gallas before following Jordan down the tunnel. "I don't know why it all got so silly," Redknapp added. "Gattuso had a flare-up with Joe Jordan. I don't know why. "He obviously hadn't done his homework. He could've picked a fight with somebody else. Putting his head into Joe's face, it was crazy. He lost his head." Milan boss Massimiliano Allegri said he was disappointed with his captain's conduct but claimed his rage was sparked by a late tackle on him by Pienaar which preceded the touchline clash with Jordan. "Flamini's tackle was quite a bad one but the foul on Gattuso on his knee was also a bad one," Allegri stated. "I don't know what happened at the end of the match. It was not nice to see. I think there was a reason but there is no excuse for that." Describing the scene on air, BBC Radio 5 live's Mark Pougatch said Gattuso had "lost it". Italian football journalist Gabriele Marcotti added: "Gattuso is an emotional player but after getting angry he calmed down enough to hug and kiss William Gallas and Harry Redknapp. "You think he is going to calm down then he goes after Joe Jordan. Absolutely incredible." Redknapp joked that it was not wise to pick a fight with Jordan, who played for AC Milan between 1981 and 1983 after long spells with Leeds and Manchester United. "There would be only one winner there - Joe," the 63-year-old Spurs boss said. "I'd have my money on Joe. Of all the people to pick on, don't pick on Joe." 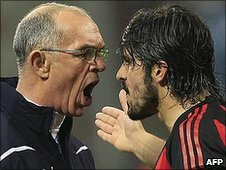 Re: Gennaro Gattuso given four-match ban for headbutt. Disgrace. I know no one was injured but can't feel the authorities bottled it and he should have been banned for more. I mean during the game he raises his hands and doesn't work and then attempts to headbutt the opposition coach after the final whistle. Oh and there was the yellow card tackle in the middle. Should have got 6 games and a massive fine. By the way what the hell does he mean by "I was nervous. We were both speaking Scottish, something that I learned when I played in his home city of Glasgow, but I can't tell you what we said." What he was speaking Scottish Gaelic?